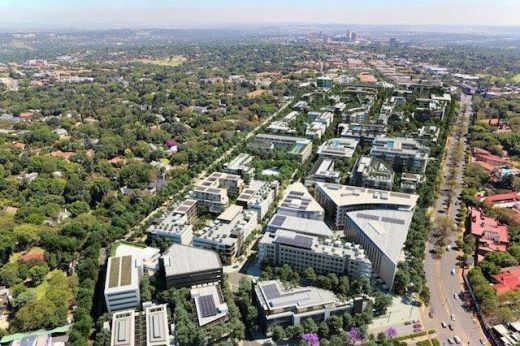 Oxford Parks, which officially broke ground in April 2017, is envisaged to be a sustainable and cosmopolitan medium-density urban environment that brings 300,000sqm of development rights to the Dunkeld Precinct linking Illovo to Rosebank along Oxford Road in Johannesburg. The precinct is targeting a 4-Star Green Star Sustainable Precinct Pilot Rating, and each building will be encouraged to attain a minimum 4-Star Green Star Design certification. 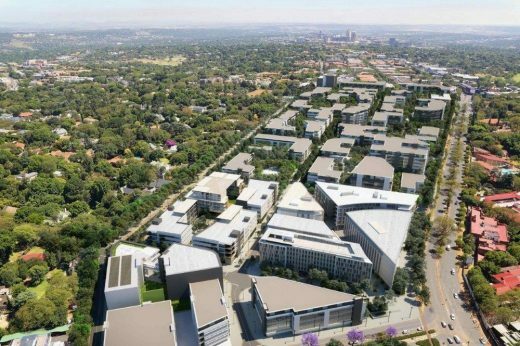 Carollyn Mitchell, Director at Intaprop, says that the vision is to build on the strength and unique energy of Rosebank to develop, from the outset, a dynamic, vibrant urban lifestyle with a strong pedestrian focus, located close to public transport offerings. Scaling of the public environment and active building interfaces was extremely important, and pedestrian-level lighting contributes towards a quality experience for pedestrians and cyclists alike. Moving from Oxford Road towards Cradock, there is a hierarchical progression of streets with the friction of road surfaces increasing so that cars are forced to slow down and be more mindful of pedestrian and cyclist activity. 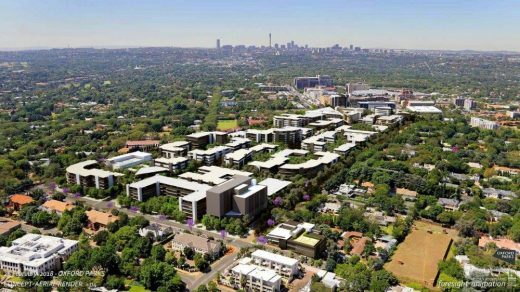 Security was a concern from the outset as the development has no fences in order to seamlessly integrate into the city fabric. Passive surveillance design techniques have been used so that the wellbeing of pedestrians is considered at all times. According to Mitchell, the precinct is run by a Property Owners’ Association, which will become a City Improvement District over time, tasked with ensuring that the vision of the development is adhered to. Building heights will range from four to six storeys, with building uses envisioned at one-third residential to two-thirds offices. 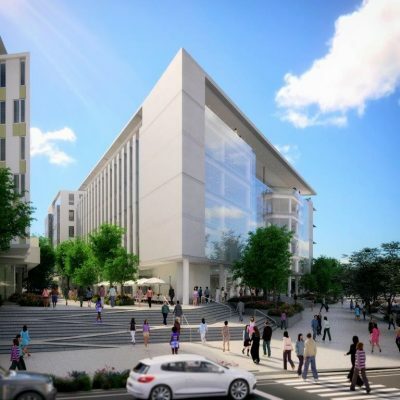 The residential component will comprise between 2,000 and 2,700 units, bringing in 4,000 to 5,000 residents; while the offices are expected to bring in 10,000 to 14,000 office workers. Hotel offerings, high-street type retail at ground floor level and various leisure activities are expected to generate a 24-hour vibrancy for the precinct. In addition to its own amenities, Oxford Parks is close to a range of services within walking distance including schools, day care facilities, a gym, medical facilities, pharmacies, dry cleaners, banks and restaurants – which reduces the need for private car trips and provides convenience for precinct users. The Precinct is also perfectly located from a public transport perspective. 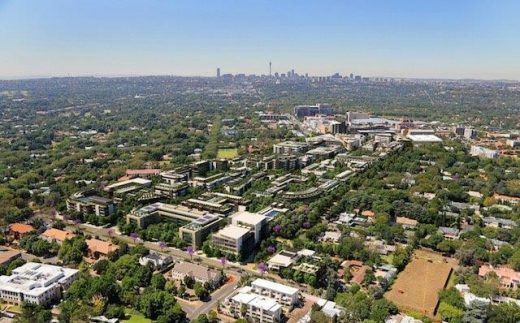 The Rosebank Gautrain Station is within easy walking distance, as are a number of bus routes on Oxford Road as well as the newly revamped Rosebank taxi rank. 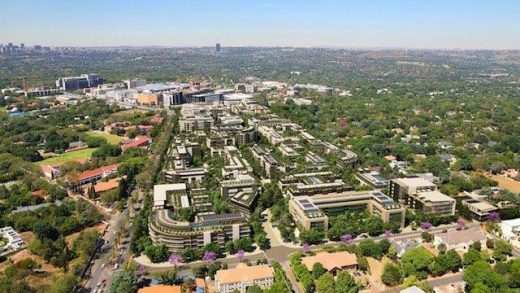 The first building in the precinct, Oxford Park Phase 1, also developed by Intaprop, has been registered with the Green Building Council South Africa (GBCSA), targeting a 5-Star Green Star Office v1.1 Design Rating. 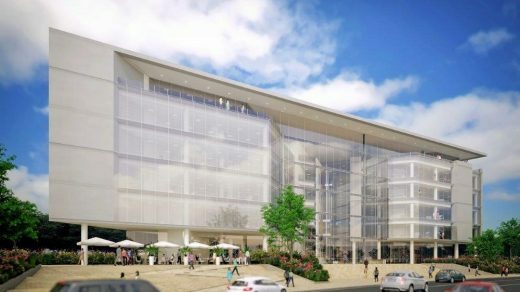 Located on the corner of Jellicoe and Oxford Roads, the project comprises 6 floors with a gross floor area (GFA) of 10,035m² excluding car parking areas. 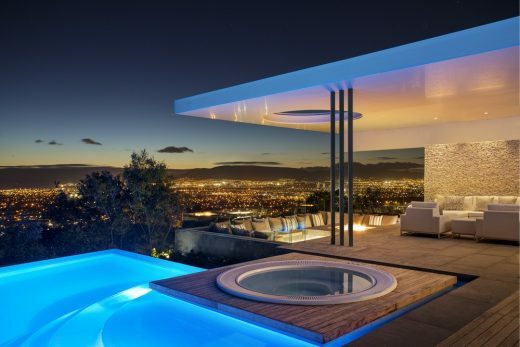 Rather than pursuing an As-Built certification, Intaprop has decided to implement commissioning and building tuning by an Independent Commissioning Agent and the project engineers, which provides a better return on investment and ensures that the building is operating optimally right from the start. 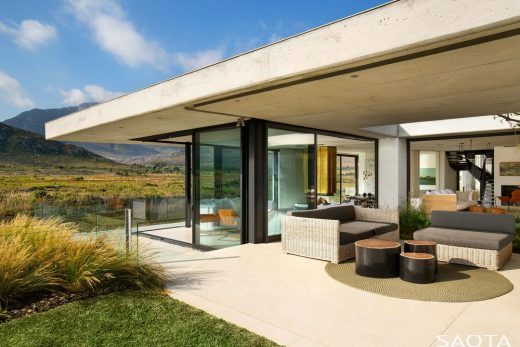 Environmental strategies are being implemented to enhance the wellbeing of the building’s users such as ample fresh air, access to external views, and plenty of natural daylight. As salaries are the biggest cost to companies, enhanced work performance and an improvement in working quality and quantity equate to direct cost savings. Being able to analyse consumption data is key to understanding and managing building systems and to assessing opportunities for savings. Accordingly, sub-metering of major energy and water consuming systems is in place. Water efficient fittings are also being installed that limit occupant water usage. In addition, to minimise greenhouse gas emissions associated with operational energy consumption, an energy model of the building was generated during the design stage, comparing the building to a SANS 10400 notional building model. This energy model has helped to inform the building design to ensure a high performing building from a building envelope perspective. Modelling also enabled internal operative temperatures to be assessed to ensure that they are within the ASHRAE Standard 55-2004 Acceptability Limits for at least 98% of occupied hours, thus ensuring a high level of thermal comfort. 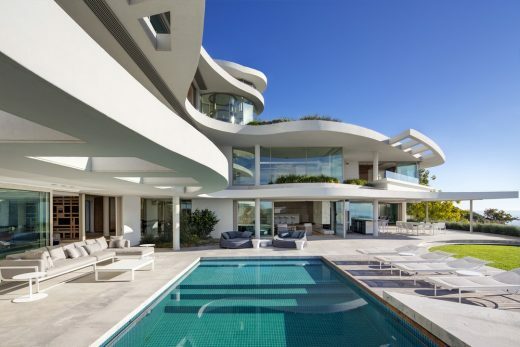 Building Glazing Performance modelling was also carried out and performance values were agreed with the architect and mechanical engineer to assist with specification of glazing. In terms of reducing energy consumption, provision has been made to ensure that all individual or enclosed spaces are individually switched with occupancy sensors. The project also saves energy by providing office lighting that is not over designed, with an average maintained illuminance level of no more than 400 lux. All selected gaseous and fire suppression systems, refrigerants and thermal insulants used for the development have an Ozone Depleting Potential (ODP) of zero, to eliminate any contributions to long-term damage to the earth’s stratospheric ozone layer. In terms of Green Star, three main requirements had to be met before the project commenced with demolition and construction – a Waste Management Plan (WMP), an Environmental Management Plan (EMP), and a Hazardous Waste Management Survey on existing buildings. NEMAI Consulting was appointed to compile both the Waste Management Plan and the Environmental Management Plan, which have been signed off by both the Bulk Earthworks Contractors and the Main Contractor. COH Consulting Occupational Hygienist was appointed to conduct hazardous material surveys of all the existing buildings that were on site, and Safe Disposal Certificates were required to ensure that any hazardous materials reported in the survey were safely disposed of by the demolitions subcontractors. To reduce waste to landfill during building operations, a waste recycling storage area has been provided in the basement within 20m of the exit. This dedicated area meets the Green Star sizing requirement, and will accommodate paper and cardboard; plastic, glass and cans; and metals. The project is also targeting the Watercourse Pollution credit, which deals with stormwater runoff. 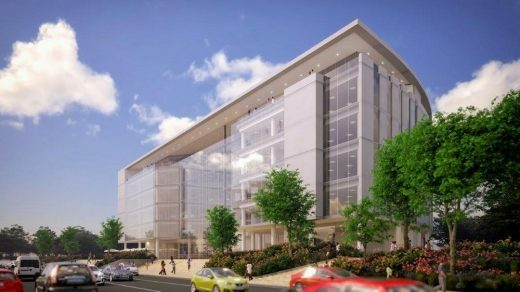 It is important that a development like this tries to capture the stormwater and reuse it within the building or within the precinct. The system has also been designed so that minimal pollutants and trash are diverted to municipal stormwater channels. Annelide Sherratt, Sustainable Building Consultant at Solid Green and the Accredited Professional on the project, says, “We are developing a Building Users Guide and Community Users Guide to enhance knowledge and understanding of the sustainability attributes implemented for the buildings and precinct. 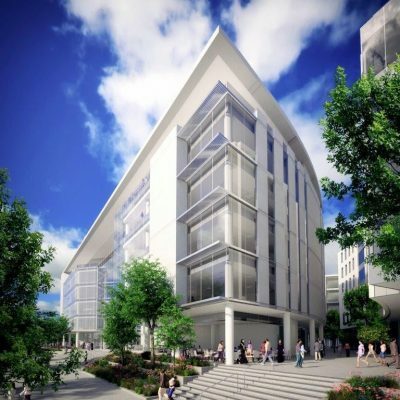 Additionally, an education facility will be provided within the precinct to provide education materials and examples of sustainable strategies used in the planning, design and construction of the project. As green building principles extend into the public realm in alignment with market demand, developments like Oxford Parks are becoming significant catalysts for positive change and urban regeneration. 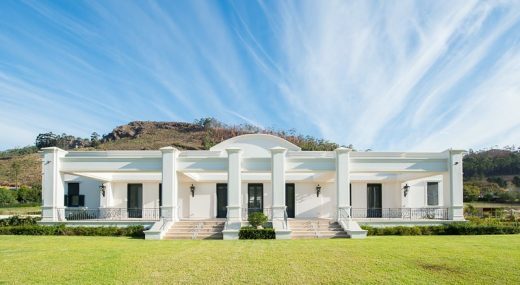 Solid Green is specialised and experienced in both Green Star SA and LEED green building certification, offering certification for offices, residential projects, retail centres, existing buildings, interiors, and public and education (PEB) buildings. All team members are Green Star SA Accredited Professionals (GSSAAP), with key team members also holding LEED AP and WELL AP accreditations.